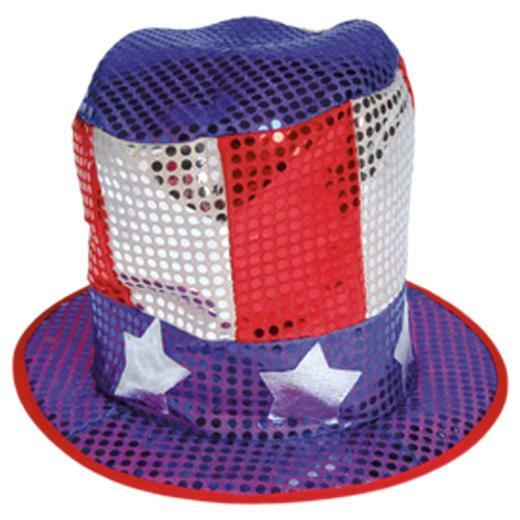 Uncle Sam would be proud to wear this sparkly sequin USA Hat. These faux sequin hats mimic the American Flag with the stars and stripes pattern. Finish off your patriotic costume with these USA Hats. Stock up on all your patriotic needs with US Toy. We have a wide selection of favors and costume accessories to make your day a success. You'll find everything you need for your next election day celebration, parade or 4th of July party in our Patriotic section. L: 12.8 in. W: 1.85 in. H: 12.8 in.